Each year, the main stream of the Amazon rises and falls 30 feet or more due to flooding caused by seasonal rainfall and snow melting in the Andes mountains. Animals and plants, and people, are well-adapted to this cyclic change; it is accepted as part of life. The floods make life more difficultit is harder to get around and everything is dampbut on the other hand, the floods deposit silt that renew soil fertility and so ensure a successful harvest. As the water rises, inundating low-lying areas, whole villages are submerged under two or three feet of water. 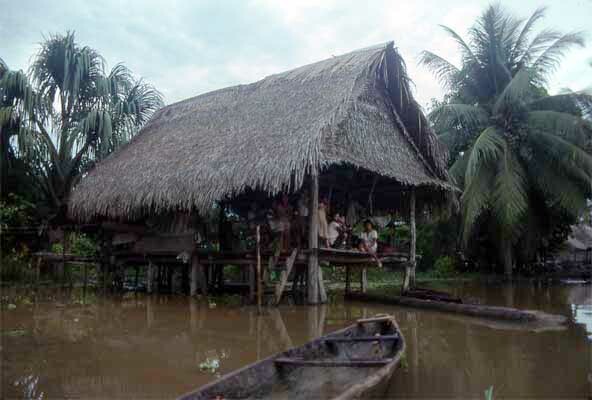 Hence, virtually every native-built dwelling is constructed on stilts. These ensure the floor of the house remains above the high water level. Local people plant their crops in areas where flooding is less likely. Sometimes they miscalculatethe river rises higher than expected. 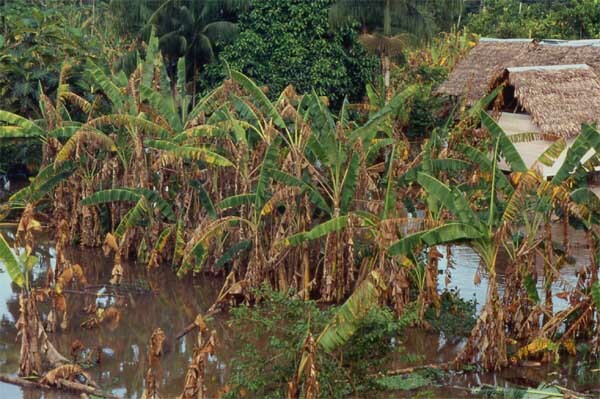 Bananas cannot survive being flooded more than a few days and an event such as depicted above results in loss of the entire crop.